To date; we have a 100% record. Please note that unlike others, we do not send Computers away for Virus Removal - Virus Repair and all repairs and installations are performed by qualified, highly experienced computer engineers. Simply call us with details of the virus symptoms. 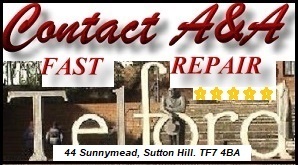 A&A Telford Computer Virus Removal can usually advise on the problem over the phone (the problem may not be caused by a computer virus). If the computer is infected with a virus we will need to work on the computer in-house (in Wellington, Telford). 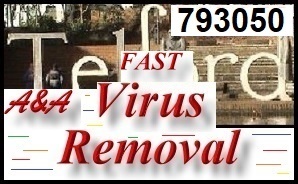 A&A Telford Computer Virus Removal can collect the PC or laptop from the address in Telford at no cost or the client can deliver the system to us. If the computer is infected with a virus we will need to work on the computer in-house at A&A Computer Repair, Wellington, Telford (near Morrisons Wellington). 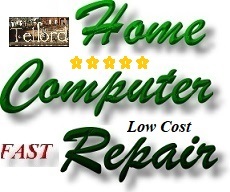 Most computer Virus removals, data retrieval jobs and computer repairs (PC Repairs or Laptop Repairs) are completed within 24 to 48 hours. 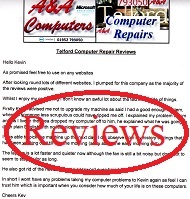 We provide PC and Laptop Computer Repair in most local areas and can collect from - return to; Hollinswood, Hadley, Trench, Shawbirch, Admaston, Malinslee, Ironbridge, Madeley, Shifnal, Dawley, Brookside, Sutton Hill, Aquaduct, Donnington, Lilleshall, Ketley, Priorslee, Bratton, Dawley, Oakengates, Muxton, Stirchley, Woodside, St Georges. There are always pros and cons to Anti Virus software. Below is an honest overview of the major Anti Virus programs. Opinions expressed are personal opinions, but based on many years of extensive experience. AVG Free Anti Virus was very popular. However; we tend to see numerous computers each week which have the free version of AVG Anti Virus installed, but which are still infected with viruses. The paid for version of AVG seems to be much better. Kaspersky Anti Virus and Internet Security are excellent. We have used Kaspersky on our systems for numerous years without issues (it protects against, finds and kills viruses which other Anti Virus SW misses - and it does not slow computers down to the same extent as other Anti Virus SW). McAfee Anti Virus is good, but also tends to slow the PC (but not as much as Norton). Additionally, we have recently seen many infected computers which have McAfee installed. Microsoft - Windows Defender is free Anti Virus which is built into Microsoft Windows 8 and Windows 10. 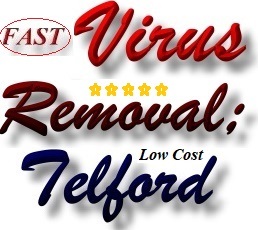 A&A Telford Computer Repair have found and removed viruses on many computers which relied on Windows Defender, or a combination of Windows Defender and low quality or free anti virus software. Under no circumstances should PCs, Laptops, Tablets or Servers rely solely on Microsoft Windows Defender if the computer is connected to a network or to the internet (many modern viruses are downloaded from the internet, they infect a computer and then search the network for other items which they can infect). Microsoft - Security Essentials is free Anti Virus which is built into Microsoft Windows Vista and Windows 7. A&A Computers have found and removed viruses on many computers which relied on Windows Security Essentials, or a combination of Windows Security Essentials and poor or free anti virus software. Computers should never rely solely on Microsoft Windows Security Essentials if the computer is connected to a network or to the internet. Norton Anti Virus is very good, but also tends to slow the PC (particularly Norton 360). Virgin Anti Virus; On April 14th 2010, we removed 238 viruses from a PC which was using Virgin Media Security. We have since seen many more severely infected computers which were running Virgin Anti Virus - Security software. There are currently many scams "doing the rounds". In some cases, the scum operating these scams try to con people into downloading software which then infects their computer in a bid to obtain peoples Bank account details, credit card details etc. If you have a Windows laptop virus or a Windows PC virus, A&A Computer Repair can usually kill the virus infections without losing photographs, documents accounts or settings etc. This is possible in over 95% of cases. If the Windows laptop virus or Windows PC virus has destroyed your current Windows installation, A&A Computer Repair can usually kill the virus, retrieve and save your photographs, documents, accounts etc, reinstall the correct version of Windows (with the correct drivers etc) for your computer and then save your photographs, documents etc back onto your computer. 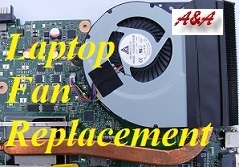 A&A Computer Repair can also save your documents, photographs etc to CDs or DVDs for nominal charge. However; in all cases, we will kill the virus and return your computer to working condition. 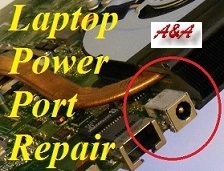 Please click below to resolve Sony laptop fan issues.